Los Islotes is located on the Pacific coast of Panama along the Azuero Peninsula, a region that has arguably the most spectacular sunsets in all of Panama. It is situated about 4 hours outsite of Panama City in the Veraguas Province. Los Islotes is a personal undertaking of Lief Simon and Kathleen Peddicord, the two principals at Live and Invest Overseas, who search Panama for many months before deciding on this location. Lief and Kathleen’s vision is not simply developing a stretch a land along Panama’s Sunset Coast, but to create a place where they, their family, friend, guests, and fellow investors can enjoy and benefit from each other’s company. The community at Los Islotes is part of Lief and Kathleen’s long term retirement plan as well as legacy for their children. The Los Islotes Master Plan calls for underground utilities, fiber-optic internet, and a waste-water treatment plant plus a Spanish colonial-styles town modeled on Antigua, Guatemala…three pools…riding and hiking trails…a boutique hotel and spa…tennis courts…an equestrian center…a boat launch…and a Founder’s Lodge. The last, our Founder’s Lodge, will be the first structure on the property which we intend to have constructed before the end of the year. Los Islotes offers investors an opportunity to become part of what will be one of the premier oceanfront communities in all Panama. Lots start at US$45,000 and financing is available with 50% down and 6% interest for 36 month. 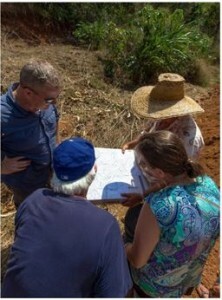 In a separate phase “Mango Village” we also have lots starting at US$29,000. There is no financing available in this phase. Come experience the next big thing in Panama! Check out of the Marriott in Panama City, Panama at 11:45 a.m.
All tour attendees will meet in the lobby of the hotel, Panama City at 12:15 p.m.
Leave for Coronado from Panama City at 12:30 p.m. Arrive in Coronado at approximately 2pm for lunch. Arrive at Hotel Mykonos in Santiago at aproximately 7:30 p.m. for check-in. Dinner at restaurant in Santiago (TBD) at 8 p.m.
Return to Hotel Mykonos for relaxation and leisure time. Breakfast at Hotel Mykonos (included) 7 – 8:15 a.m.
Leave for Los Islotes from Santiago at approximately 8:30 a.m. 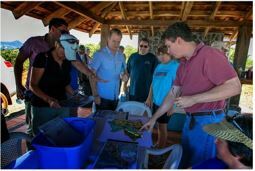 Arrive at Los Islotes at approximately 10 a.m.
Meet at the rancho where you will receive a general overview of the development from the Los Islotes team and meet with our project manager and crew Begin tour of the property. BBQ Lunch at the rancho at approximately 12 p.m. During this time you will have a chance to ask questions about the property and inquire about specific lots you may be interested in Individuals and groups will visit specific lots throughout the property. Leave from Los Islotes to Santiago at approximately 4 p.m.
Dinner at restaurant in Santiago (TBD) at 7 p.m.
Return to hotel Mykonos for relaxation and leisure. Breakfast (included) and check-out at Hotel Mykonos 7 – 8:15 a.m.
Leave for Panama City at 8:30 a.m. Arrive in Panama City around 2 p.m. Tour attendees will be transported to the hotel of their choice. The cost of the tour will be deducted from the purchase price should you choose to invest. Reserve my spot on the tour in June. Make Payment Online: Reserve your place on the tour by making your payment here. Once you reach the payment page click the “Reserve My Place” button and enter your payment details Click here to reserve your place. Payments Via Paypal: Tour payments via Paypal should be sent to lief@losislotes.com. You would go into your account go to the “Send Money” tab, then enter lief@losislotes.com as the recipient along with the amount to be paid. After that you will be asked to confirm the transaction. Make Payment By Phone: Contact via phone at 1 (815) 701-9300 with your credit card information and we can manually enter the transaction. Ask to speak with Kiley. All Payments must be made before Monday, June 6th. Tour attendees will be responsible for their own hotel accommodations after June 12th.